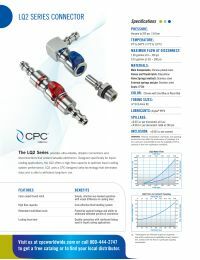 Home / CPC: Colder Products Company / LQ2D2304LBLU Valved Elbow Locking Hose Barb Harb Liquid Cooling Coupling Insert 1/4"
LQ2D2304LBLU Valved Elbow Locking Hose Barb Harb Liquid Cooling Coupling Insert 1/4"
LQ2 Series provides ultra-reliable, drip-less connections and disconnections that protect valuable electronics. Designed specifically for liquid cooling applications, the LQ2 offers a high-flow capacity to optimize liquid cooling system performance. LQ2 uses CPC developed valve technology that eliminates drips and is able to withstand long-term use.